We’ve seen a number of contactless credit card enterprises hitting the news recently, backed by big names and with slightly different notions about how the technology works. But the news that AT&T and Verizon are forming a joint venture to compete in this space totally transforms the market from a slightly boring, and long-term one, to a dynamic and exciting one. Bloomberg notes that the efforts include T-Mobile USA and will be piloted in stores in Atlanta and three other U.S. cities and would use behind-the-scenes processing systems from Discover–currently the fourth biggest payments network after Visa, Mastercard, and American Express. There’s lots of game-changing happening here, and the industry is at a tipping point (with consumers ready to adopt the tech in large numbers, even though it’s been around for decades in one form or another). 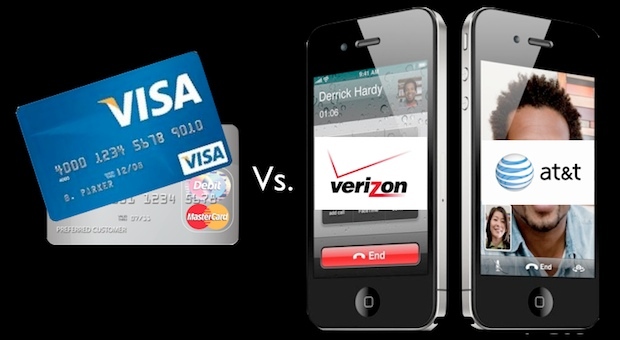 But the ways my cell phone providers think they can succeed where the giants of credit have failed start with the very system that credit-card-phones would use. Essentially a cell phone would be modified with the addition of an RFID antenna and chip–the same kind of short-range radio data systems used in some metro and smart bus ticketing systems around the globe. In its simplest iteration, the RFID tech would be embedded into the phone, operating independently of it–like a radio-based version of the magnetic strip on your credit card. But instead of sliding your card through a machine and tapping in a PIN, you’d drop your phone on an RFID reader, and tap in a PIN. Now, when the RFID system gets integrated with a smartphone’s circuits, a whole world of possibilities opens up, including using the smartphone’s screen as a super-secure numeric pad for accessing your PIN or even using the smartphone’s sensors as a more secure user-ID detection system. Using location data sent over the phone’s data network would also ensure greater security, as you’d know that the phone is being used where it says it is, and no-one’s cloned the RFID data to steal your money. There’s also the opportunity for retailers to send data back to your phone, in the form of adverts or loyalty card-like reward points. It works for consumers too–they’d only need to carry one device to act as phone, media player, PDA and credit card, versus having to use a modified Visa RFID card too. The phone networks already have user’s personal data, and your payment details, and the wireless network to enable all sorts of higher-level exploits of the system. There’s also the opportunity for stranger uses of the RFID–they can be remotely pinged, for example, and that would enable the kind of personalized dynamic ads you see in sci-fi movies set in the near future: In one implementation of this, the ads could even send data over the air to your phone. But Bloomberg missed out on one big piece of analysis in its report: Who would Verizon and AT&T be working with to provide the technology to make their idea work? The answer will be “many different cell phone makers,” of course, but with a special emphasis on one: Apple. That’s because Apple has already been very aggressively patenting ideas in the contactless credit card/smarthphone space–including rethinking many aspects of the traditional shopping experience. It has the tech pretty much already in place to do all the data processing, can easily add specialized apps to the iPhone, and has been experimenting with more heavily ad-integrated systems in the OS. We know there’re strong rumors that Apple’s got a Verizon phone en route, and it’s already partnered with AT&T. And what better way to sell the iPhone 5, than to distinguish it from all the other smartphones with an ad strapline like “now your iPhone lets you ditch your old credit cards too”?